The Ardnamurchan peninsula is a fascinating place to explore, with remote sandy beaches, lochs to fish and hills to roam. You will never be far from a view of the sea. At Kilchoan there is a small ferry to Mull, and at the end of Ardnamurchan you'll find the lighthouse, which marks the most westerly point on the British mainland. 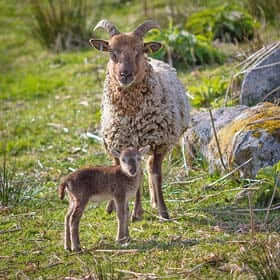 Should you wish to explore further, Bluebell Croft is within easy striking distance of Lochaline where there is another small ferry to Mull, which gives access to Iona, Staffa and more. A little further north are the white sands of Morar and Arisaig from where you can take a magical boat trip to the Small Isles of Muck, Rum and Eigg. The winter skiing and summer mountain gondola rides of Nevis Range and Glencoe are just as close. Strontian has a fascinating history. In the 17th and 18th centuries it was home to one of the biggest lead mines in the world but today little remains of the mines where once thousands worked. Strontian is now a quiet, sleepy village, proud of its role as a guardian of the local woods and rivers, through the recent formation of the Strontian Community Company. The National Nature Reserve at Ariundle is just a mile or so away, and Strontian is located in the middle of the Sunart Oakwoods initiative area. The programme, operated by the Forestry Commission, maintains and develops the remains of ancient oakwood that are found in Lochaline to the south, and all along the south-facing shore of Loch Sunart, from Strontian to Salen. This ancient woodland is of great importance to a wide range of plant and animal species. There is an impressive coastal hide at Garbh Eilean 4 miles away, perfect for wildlife-watching. Set in a spectacular, elevated, west coast location on the Ardnamurchan peninsular with stunning views of mountains across the Strontian glen in the West Highlands of Scotland, Rose Cottage is a luxurious self-catering holiday home which sleeps 4. It adjoins Honeysuckle House: each property can be rented separately or together to create a larger entity with room for at least 12. Situated on a sustainable working croft, it is possible to order lots of tempting ingredients, all produced on the croft. Waiting for you on arrival will be warm scones, raspberry jam, marmalade, wine, and organic bread and more can be ordered for later in the week. 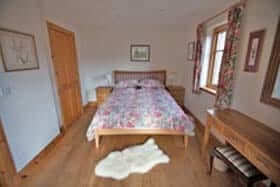 The cottage has two bedrooms; one double bedroom and one twin bedroom. 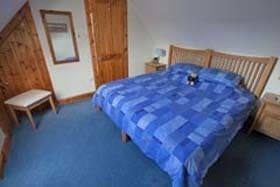 The double room has a king-size bed, and the twin room can be turned into a super king-size zip and link double. Two additional single beds can be added anywhere. There are large goose-down duvets (synthetic are available), extremely comfortable mattresses and no sofa-beds, so everyone will get a good night's sleep. Both bedrooms have en-suite bathrooms, are fully tiled with underfloor heating and are stocked with huge fluffy towels, soaps and loo paper. Downstairs is a spacious wet room and there is a baby-bath available for toddlers and babies. 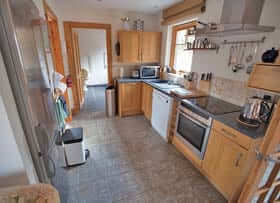 The kitchen is superbly equipped for people who like to cook. There's a Neff oven, along with an induction hob, Magimix food-processor, hand held electric whisk, plenty of saucepans (including a big one) and sharp knives. 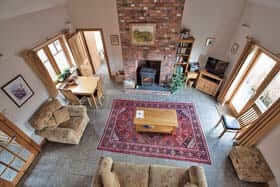 It is warm, well insulated, with underfloor-heating downstairs, a large wood-burning stove and as much wood as you need. There's free wireless broadband, a TV, DVD, CD player, and it is stocked with books and board games. For guests with children, cots, highchairs, toys, games and books are provided and a trampoline is available for the older ones. The porch is ideal for drying wet clothes, boots and dogs. Well behaved dogs are welcome by arrangement and with care, although they must sleep in the porch and they are not allowed upstairs, in bedrooms or on soft furnishings. Outside, there is a barbecue which runs on wood or, if you prefer to bring your own, charcoal. Tables and chairs are in a wonderfully secluded, sunny spot facing south towards Loch Sunart. 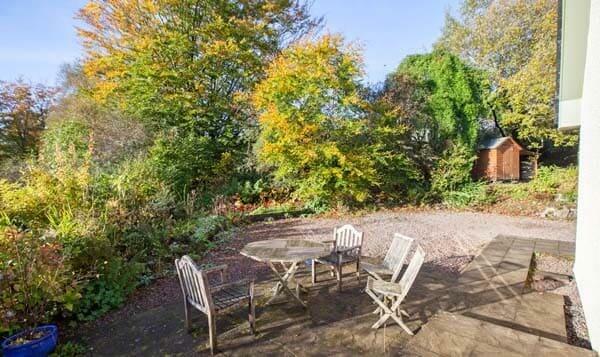 The hot tub is easily accessed from the patio in front of the sitting room and is for the exclusive use of guests staying at Honeysuckle House and Rose Cottage. 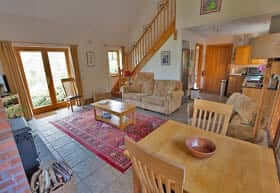 Rose Cottage is very wheelchair friendly. There is a wheel-in shower in the downstairs bedroom, and there is easy access throughout the downstairs (Category 1 means un-assisted wheelchair access). The house has an electric hoist but please brings your own slings. 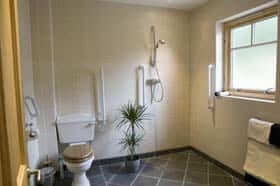 There is also a height adjustable shower/commode chair which is fixed ie not wheeled, loo raiser and bed/chair raisers. There is a trapeze over the bed. 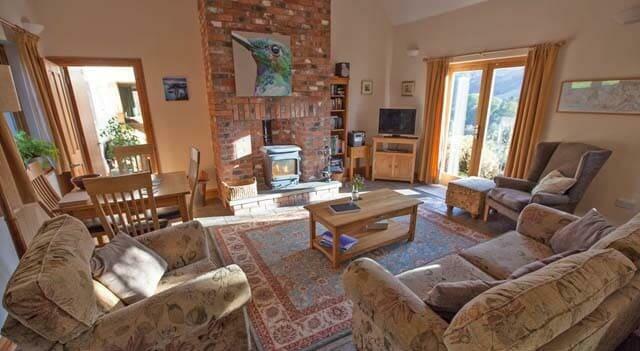 To find this lovely holiday house in Argyll, drive 10 miles south of Fort William and take the Corran Ferry at quarter to or quarter past the hour; turn left and Strontian is 15 miles. After the bridge in the middle of the village turn right and Bluebell Croft is 1/2 mile on the left. Heating, logs and kindling are all included. Bed linen, towels and hot-tub towels are provided. A casserole can be left in the oven for arrival - made from beef from the working croft. Ingredients such as eggs, seasonal fruit, vegetables and salad crops can be pre-ordered for your arrival and are available throughout your stay. Quality local produce such as smoked salmon, cheeses, bacon and sausages can also be pre-ordered. All necessities such as dishwasher tablets, washing up liquid, liquid soap and liquid for washing machines, all by Ecover are provided. Also provided are fabulous, locally handmade soaps. Please don't bring your own chemicals as it will upset the delicate nature of the septic tank and soak-away. Washing-up brushes, scourers, cloths, tea towels and aprons are all provided. Recycled Fairtrade loo paper, kitchen roll, tissues and degradable bin liners are provided. In addition the kitchen will have salt, black pepper, Fairtrade tea, ground coffee and sugar. Rose Cottage is rented out throughout the year. Honeysuckle House which adjoins via a large conservatory can be rented together with Rose Cottage to create a large house sleeping 12. Change over day is Friday with check out by 10am and check in 4pm. To book this charming self-catering cottage on the Ardnamurchan peninsular, click the enquiry button below and see availability and rental prices. 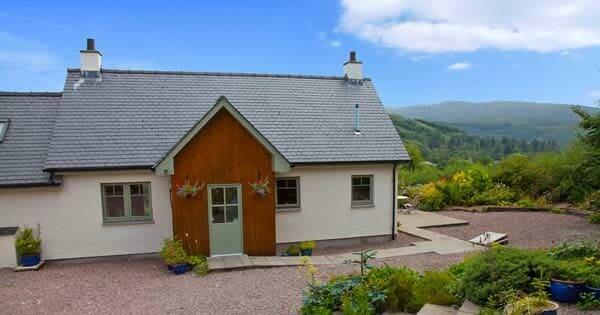 If you're looking for a 5 star self-catering cottage then this is ideal! 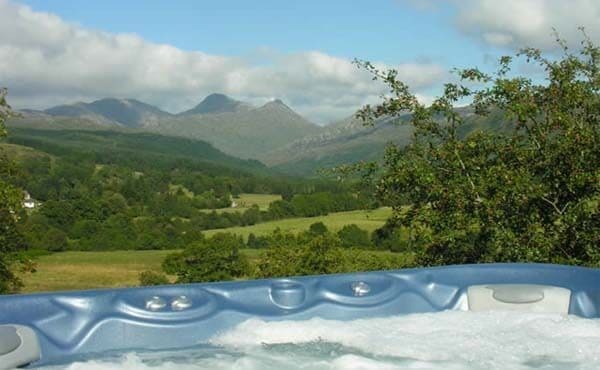 Set in the glorious Argyll countryside with stunning views, it has a hot tub too - great for relaxing in after a long walk in the hills!